We help create a world in which invention can thrive. So when we find a way to support and collaborate with organizations that are taking on big ideas, we lend our support. Each opportunity is unique; what’s common is our commitment. Our community relations initiatives complement our values and encourage our diverse teams and employees to contribute to the local communities in which we live and work. From multi-year commitments to local nonprofits, to encouraging volunteerism through paid time off, to onsite volunteer engagements, we aim to create lasting impact and connections in our community. Learn more about some of the organizations we support below. 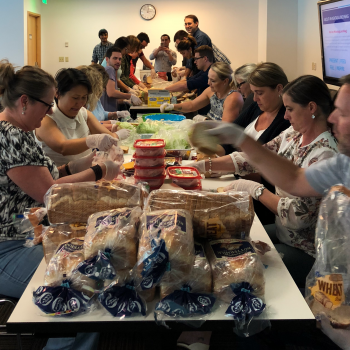 Employees make lunches for distribution to a youth program in South Seattle with #HashtagLunchbag. The Pacific Science Center presents award-winning, innovative programs to more than 1.1 million people each year, igniting curiosity and fueling a passion for discovery, experimentation, and critical thinking in all of us. Techbridge Girls excites, educates, and equips girls from low-income communities by delivering high-quality STEM programming that empowers a girl to achieve economic mobility and better life chances. Rebuilding Together Seattle serves low-income homeowners who are elderly, living with a disability, families with children, or veterans in need. Every year for over a decade, our employees roll up their sleeves and help rebuild a home in our community. Hopelink has served homeless and low-income families, children, seniors, and people with disabilities in the greater Seattle area by providing stability and helping people gain the skills and knowledge they need to exit poverty for good. Our global offices give back, too. In Dublin, Intellectual Ventures (IV) sponsors the BT Young Irish Science and Technology Exhibition. The event encourages future scientists to explore ideas and showcase research projects during the annual competition. We sponsor the Special Awards category, and each year host the winner at our headquarters for a day of mentoring. The Boys & Girls Clubs of Bellevue is on a mission to inspire and enable all young people, especially those who need us most, to reach their full potential as productive, caring, and responsible citizens. FIRST Washington inspires all young people to be science and technology leaders through exciting mentor-based programs that build STEM skills, inspire innovation, and foster well-rounded life capabilities. WTIA is an influential co-op of 800 tech companies large and small and the unifying voice for the technology community in Washington. They consolidate the power of member companies to solve business problems they can’t solve on their own. The Technology Alliance is a statewide, non-profit organization of leaders from Washington’s technology-based businesses and research institutions united by our vision of a vibrant innovation economy that benefits all Washingtonians. The Chamber engages the innovation and entrepreneurship of its members to advance economic prosperity, advocate for a vital business environment, and build sustainable and healthy communities in the Seattle region.